By, Raphael Reboh, celebrity stylist and founder of Femme Coiffure Hair Spa in Miami Beach. He reveals his rules regarding how to find the perfect hair look for the big day. A woman’s wedding may very well be the biggest event in her lifetime. All eyes are on the bride on her big day and the expectation is that you’ll look your very best. On your wedding day you should look like the very best version of yourself. This means if you are a casual person in your daily life who never wears makeup, your wedding day is not the time to break out your inner Kim Kardashian. Likewise, if you walk around looking like a Kardashian in your daily life, this wedding hair experience is going to be ultra glam for you. Start collecting pictures now. Throughout this process, check in with your gut. Does this feel right? Does this feel like you? If you want extensions, get them. If you don’t want to grow out your short haircut, don’t. If you don’t want to wear that moth-eaten veil from your mother’s 1978 wedding, don’t. Before you do anything hair-wise, you should pick your dress. A bride’s hair should complement her dress, not compete with it. Your veil is different. If you choose to wear one, you can actually choose a veil based on the hairstyle, or vice versa. Another good rule of thumb for selecting a hairstyle is to consider your personality and the wedding theme. Are you a casual person getting married barefoot on a beach? Consider keeping your hair down. Are you spending $1,000 per wedding guest to marry on the top-floor of a Manhattan high rise? Consider a formal updo. Is this a farm wedding? Cascading curls! You’ll want to consider your hair texture and length as well because if you want that shellacked updo, you’re going to need long-ish hair to achieve it. There are many amazing hairstyles for short hair brides, so do not fear! As for hair texture, don’t fight your natural texture. Curly hair looks amazing either down or up. Straight hair can be curled into waves and wound into ornate updos (with the help of pins and hairspray). Wavy hair can be either straightened or curled and is the perfect texture for half-up/half-down styles as well as updos. Rule No. 3: Overall Big Day Tips! Your stylist will know how much time is needed to do your hair so be sure to schedule that into the day. Give yourself plenty of time, especially if you have long hair. 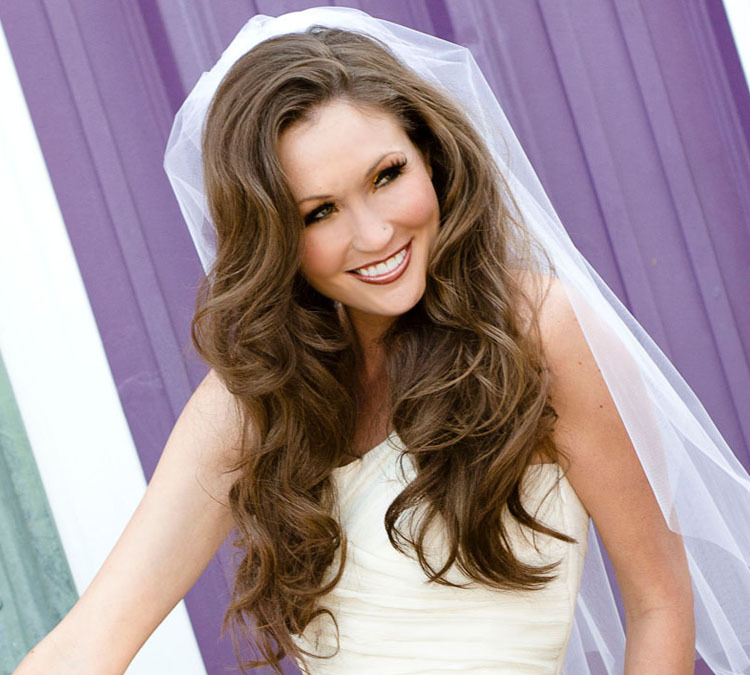 Keep in mind the timing of your wedding party hair appointments as well. Your stylist should know how much time to schedule. Some brides with fine hair opt not to wash their hair the day of or even before the wedding because the dirtier hair is, the better it will stay in an updo. Bring extra pins and hairspray along to the reception just in case your updo starts to fall. You can run a hair dryer sheet on your head if there’s static in the air and your hair gets frizzy.